What to do with the boring side of your house. We all have them, that small space at the side of the house where nothing grows but those pesky weeds. This area can be tricky to work with but a well thought out design can make a world of difference. This area has low light, tall walls and it’s damp. These all sound like tough issues to deal with, but wait, we can use these issues to our advantage. Make the outlook from the side window enticing and calming. Show that this space can be used for more than just the air-con unit or hot water heater. 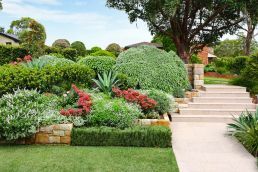 Green walls are great for these spaces, they can cover a blank tall wall or fence and be filled with plants that love shady conditions. Timer batten screens are another design element that can be used really well in tight spaces, the vertical battens can screen an ugly fence or soften a brick wall. 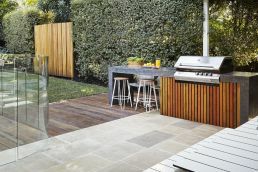 Try combining the wall dressings with large format stepping stones surrounded by ground cover planting in a pea gravel. Put all these together to create the small space that you want to look out on and are happy to take your time walking through.